I know, what I say. Samsung has offer many products with a low quality. The CD-Roms that closes itself I´ve seen at 5 drives from 12 (32x and 48x). The DVD-Rom-drives died often under a one-year-use. Look at the last reviews from CDFreak and look at the writing speed/quality at their last Combo-drives: slow and bad writing quality. The only Samsung-products I will buy are Ram-memory and montitors, other products from Samsung I´ve had bad experiences. You are repeating the same thing so I'll repeat mine, too. There are other users who have had good experiences with Samsung optical drives and I'm one of them. So what's the point of saying "I had bad experiences with company A" over and over again? And what about Samsung's latest combo drives? I have had two SM-352B. · Retail package, includes Nero and PowerDVD. · Supports 52X CD-Writing speeds and 24X CD-Rewriting speeds. · Supports reading and writing of CD-Text information. · Supports reading and writing of full SubChannel Data. · Can read and write 99 minutes discs. · Good and fast at backing up protected games, supports “Correct EFM encoding of regular bit patterns”. · Very good Mount Rainier performance. 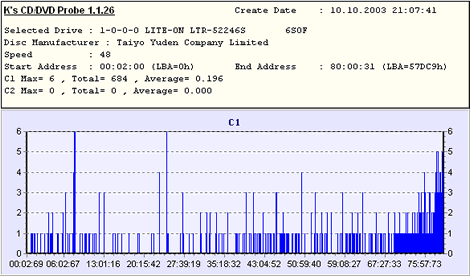 · Working recording quality checking function, which slows down writing speed if required. · Drive is very light and will be a good choice if you care about weight. · Supports Multi read that means it could read all types of CD/DVD discs. · Excellent Secure mode reading performance in EAC. · Retail package does not include any empty media and printed manual. 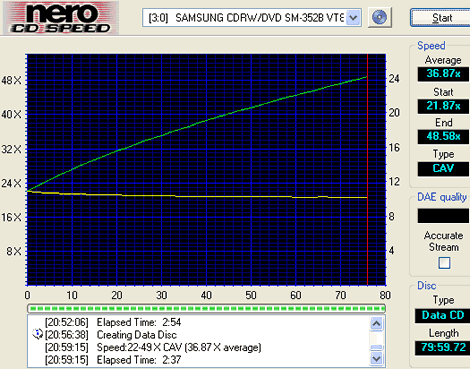 · CD-R and CD-RW disc reading locked to 40X. · Slows down easy when reading CD-discs. · Over sensitive recording quality checking function, nearly no CD-R discs would be written at full speed without slowdowns. · Do not read cactus data shield protected audio discs. · Makes a whining sound when reading certain discs. · Drive gets worm to the touch under heavy use. · Do not live up to its specifications, as it did not reach its advertised speeds in most tests. Where's the slow and bad-quality writing you said about? For example, LG writing 4x media at 4x is slow? Writing some Taiwanese media advertised at 32x but not as good as Japanese 32x at 24x is slow? That has less to do with performance and quality but more to do with philosophy in drive design. Samsung have also implemented a working quality control while writing and reading which reduces the speed to keep the quality up. In our opinion this quality control is to sensitive and makes it unable to read and write most discs at top speed. Well, I posted about Samsung's new 16x DVD writers and also 12x cousin or twin or whatever, but nothing is said about the drives themselves, not even remotely. Back to the original subject. Right now, TS-H552 price is falling a little and there are many more dealers that sell TS-H552 and TS-H542 today than last week. The current lowest price is 177,000 Won but with the appearance of "reverse-imported" TS-H552 in mid- or end-August, it will be about 100,000 Won which might be a little lower than reverse-imported LG GSA-4120B. Guess what I ordered this afternoon? Sony is one of the worse when it comes to quality control. A batch (or 2?) of their Xplod car head units would literally explode (read: overheat ). I avoid their products as much as possible. I used to like Sony but I was disappointed at the latest business practices of Sony Korea. I hear Sony Korea is expanding but what kind of benefits that'll bring to consumers, I have no idea. I even bought the expensive DSC-F717 and DRU-500A (and later also DRU-500AX OEM) and was going to buy Sony notebooks and DSC-T1, but thought otherwise due to Sony Korea's disappointing movements. Add to that one of Sony Korea's employees is my friend and he borrowed a little over US$250 from me in October, 2003, and never tried to return it to me. I was tired enough so I just removed his accounts from my MSN messenger. I now have an DSC-F717 which will stay here that I won't ever use again. The best things Sony made were Walkman cassette tape recorders and Handycams and Trinitron display devices. Due to the proprietry MemoryStick compatibility, I'm afraid of buying any Sony camera or camcorder now. The latest Sony flat-panel devices are going to use Samsung-made panels and there are going to be other makers that use panels made by Samsung with similar or even better qualities though Sony'll get the newest components from the brand-new 7th-generation plant being built right now in South Korea. One sheet of glass from the line has approximately 4 square meter area and can be used to produce muliple 50-inch 16:10 HDTV or high-resolution monitors that will help Sony to keep ahead of the most of the rest at least for a while. I thought you were in Japan. Everytime I hear the Japanese electronics companies do great "after service" to Japanese domestic consumers. I have heard it's so good that there are many South Korean consumers that buy through people who travel between South Korea and Tokyo and when there are problems with the things they bought, they ask again for service in Tokyo. Nothing like in South Korea. If Sony Japan is that bad, you will want to bomb Sony Korea or Samsung service centers in Seoul. Kennyshin wrote: Nothing like in South Korea. If Sony Japan is that bad, you will want to bomb Sony Korea or Samsung service centers in Seoul. Can it be that kenny is not is impartial? There's nobody here who has more reasons to want them destroyed. You first started senseless bashing against one large and important manufacturer without bringing any substantial evidence. None of what you said against Samsung optical drives seemed valid in my opinion. And it's Kenny and Korean, not kenny and korean. You knew exactly how to spell them properly. To be object, what are the reasons that NEC ND-3500A is discussed more actively than TS-H552 that Samsung and Toshiba are jointly producing? You can name a few, but the biggest reason I know is that something I call prejudice. If I am not impartial and of course I am not because I am only human and nothing in this universe is really impartial, I am not impartial towards Germans because I like to think Germans are objective, precise, to-the-point, thoughtful, and what Nitzsche nearly called superhuman. There are ways of the Creator to remind me of how biased I could be at times. Because Samsung TS-H552 and LG GSA-4120B are worth a lot more than Plextor PX-712A which you have said is the better choice of drives? YOU are the most partial poster at CDRLabs forum I've ever seen. It was tolerable to me for a long time but you never seemed to refrain. What makes me make the South Korean manufacturers better than what they really are when I tried to import from Taiwan and Japan at my own cost just to bring some sense to the South Korean market duopolized by Samsung and LG? To be more honest, it's been getting strange indeed that you have propagandized for the benefit of Plextor brand name for a long time. Since I have had a few Plextor optical drives and a few LG optical drives, the more I test and think, I tend more to believe a Plextor PX-712A is worth US$40 at most and a Plextor PX-708A is worth US$30. Even that, Plextor will not able to sell better than LG or Samsung. Not even close to BenQ or BTC. As per the worth $40 part, I think that ClayBuster would agree with you, . His auction. It was priced at $40 with $95 shipping, but he decided to make it $120 with $15 shipping recently. To me it does not matter how well something sells, it matters what the quality of the product is, just because it sells, doesn't mean it's good, in the US, a product that sells the best in it's class tends to just mean what's the cheapest. When I was refering to you making Korean manuf's better than they actually are, I was talking mostly about your preference for Samsung HDD's. So you are saying WD sells well because it's cheapest and NEC sells well because it's cheapest. If you now want to make yourself more impartial than past, do bette than that. There were reasons why you've got a "aviationwiz Plextor Fan(atic)" title. It's only that you also contributed a lot of posts here that you just got that title. In other places, you would have been banned a long time ago. Since you seem to be very young and have good intentions, try to lose more of your prejudice. I've got no less than 30 WD HDDs and many SCSI HDDs from Seagate and IBM, and also several 2.5-inch HDDs from Toshiba and Hitachi. I have a preference towards Samsung HDD? This was my post. When I want to have the most reliable HDD, I choose Samsung. When I want the cheapest HDD, I buy WD's. When I need performance, Hitachi's the answer. Maxtor's expensive, slow, and unreliable, especially so in South Korea. I'm not talking about performance alone, but also company polices regarding distribution channels, prices, and warranty. And visit http://www.danawa.co.kr before you say furthur. Unlike you, I actually visit Pricewatch.com and Pricegrabber.com among thousands of US hardware sites. You surely don't want to do that about South Korean market but still care to say I make South Korean manufacturers look better than they are. That's only racist, nothing more, nothing less and racism is also the product of ignorance and neglect. Trust me, come live in America, and you'll see that in most cases, what sells the best often ties into what is the cheapest drive. Americans are cheap, there is no way around that. In other places, you would have been banned a long time ago. I was un-banned from the site that I think your talking about. I was on the site you linked to for no more than 60 seconds, why? I don't know Korean. I know English, my Hebrew is good, and my Spanish is OK.
You visit American hardware sites? Good for you, you have your interest of how the markets play out, seperated even geographically, I have my interests of aviation, and politics. I visit very few hardware sites at all, let alone some outside my regional scope. aviationwiz wrote: Trust me, come live in America, and you'll see that in most cases, what sells the best often ties into what is the cheapest drive. Americans are cheap, there is no way around that. That's exactly why you'd better just tell your own experiences instead of saying as if I posted here to promote South Korean interest. I'm the last person to do that here. You should live longer to know just how much I should hate South Korea and Koreans in general if I were more like an average personality. I told my wife to kill our baby if she didn't want to leave South Korea forever hundreds of times and that's just a small thing for me. As for the US market, I've spent more time than you about that. As for the unbanning, I am still a CDFreaks moderator though I do't actively moderate any forum there now thanks to the understanding among the CDFreaks moderation/staff team so I know what happened. I didn't mean only CDFreaks, but it's against the rules and harms general environment in most hardware forums that don't specifically discuss only one brand or one manufacturer like some AMD forums or some ATi forums. And you were not actually banned the way one can be banned at many other places. It's called "sin-ban" which is deactivated as soon as the sin-banned apologizes or provides an explation. You were sin-banned there not because your Plextor-fanaticism but because of the "deals" you posted in a place meant for non-interested individual consumers to share information about the stores one can find in one's region that sell at low prices and can be trusted well. You didn't try to see what wrongs you did but just spammed the staff members there. It was a mistake on your part, is what the admins there decided and is also what I said about it, so you were not banned permanently. Yes, I know that your a mod there, that's why the first thing that came to mind was CDF. I also know all about the "sin-ban" system, and all that jazz, but this isn't the place for me to rant about CDFreaks (I leave that for the Rants n' Raves forum to later be locked.) The fact of the matter is, I did something wrong, as did the staff there, our actions weren't warrented, but, oh well, sh*t happens. OK, this is going way off track. Banning.. killing babies.. How does that relate to Samsungs drives? It doesn't. Clean it up and get the discussion back on track or I'll be doing some banning of my own. Sorry, but my experiences with Samsung are not really good and I say what I mean. It don´t matter to me that Samsung is big, big didn´t means good. I had some Samsung optical drives and only annoyance with these things (I don´t tell the details, because I wrote it already). My first Samsung harddisk live only 6-7 month (not often used). And i have the feeling that you didn´t will accept other experiences/opinions than you have with Samsung. So, that´s my last post in this thread about experience with Samsung. Wiz, come on man, get back on topic! Kenny, I have a Samsung 120GB HDD, 20GB HDD and a SD-616 DVDROM. Nice quality, very good warranty terms. Their pricing in the Indian market is very good, and we just bought a new TV for the hall.. went Samsung for that too. Pretty pleased with it so far. Well, I guess nobody's interested in TS-H552 at all then. I'll simply stop talking about any Samsung drives here. Come to South Korean forums and read it in Korean if anybody wants something there. I'm out. Kennyshin wrote: Well, I guess nobody's interested in TS-H552 at all then. I'll simply stop talking about any Samsung drives here. Come to South Korean forums and read it in Korean if anybody wants something there. I'm out. Kennyshin, that's not true at all. You gotta realize that some people have had poor experiences with some of Samsung's CD writers and are concerned that their DVD writers are going to be same. It's nothing against the company, Koreans or you. Personally, I appreciate the insight you bring. Ian wrote: Personally, I appreciate the insight you bring. Do you plan to review this drive? I heard that Toshiba and Samsung have a joint-venture with optical drives (take a look at the new Toshiba SD-M 1912, FW-version don´t look like Toshiba). Scour wrote: Do you plan to review this drive? Yes, if I can get one. For some reason Samsung hasn't been to forthcoming with their DVD writers. Kennyshin wrote: Well, I posted about Samsung's new 16x DVD writers and also 12x cousin or twin or whatever, but nothing is said about the drives themselves, not even remotely. You have a very good point. Most people are afraid to try something different and narrow minded. It's just wrong and stupid to judge any manufacturer purely based on a single bad experience with them.